In June 1898, three years and two months after departing Boston in his aged oyster sloop Spray, Captain Joshua Slocum made land fall in New England and became the first person ever to sail alone around the world. The voyage capped a lifetime of adventure for the indomitable Slocum, who had advanced from seaman to captain during the challenging final years of commercial sail, surviving hurricanes, mutinies, shipwreck, and the death at sea of his beloved first wife, Virginia. 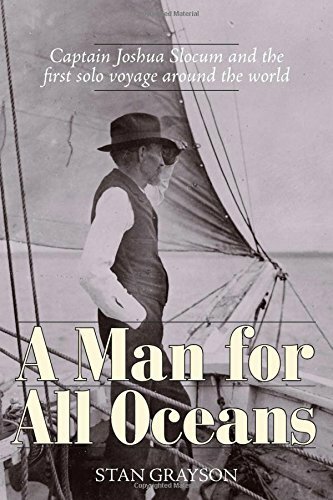 Sailing Alone Around the World, Slocum’s book about his circumnavigation, is a seafaring classic, unmatched for adventure and literary verve, and has never been out of print since its publication in 1900. Yet despite several biographies over the decades, Slocum the man has remained unknowable to his legions of admirers, the facts of his life and career as elusive as a ship on a fogbound sea. Here is the real story of Slocum’s Nova Scotia childhood, his seafaring career, and how he became an American citizen. Grayson gives ample evidence of Slocum’s uncanny genius as a navigator while also noting the occasional role that good luck played in his voyages, including his odyssey from Brazil to the United States in the self-designed and built 35-foot Liberdade. And Grayson brings a sailor’s perspective to Slocum’s solo circumnavigation and mysterious disappearance at sea. 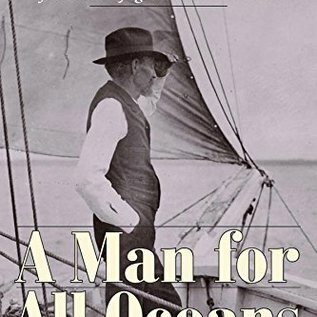 A fascinating appendix compares Sailing Alone Around the World with Thoreau’s Walden and shows that Slocum’s simple lifestyle and self-sufficiency prefigured today’s emphases on the environment and living responsibly. Previously unpublished photographs bring Slocum’s world to life, and detailed maps trace the adventures of a sailor who knew the world like the back of his hand. This biography reads like an adventure narrative and will serve as the standard work on Joshua Slocum for years to come.